Радиостанция GM1200E предназначена для работы в транкинговых системах связи стандарта МРТ 1327 и удовлетворяет всем его требованиям (включая поддержку протокола передачи данных МАР27). GM1200E может работать и в конвенциональных (не транкинговых) системах. Not offered for sale in the U.S.A. The Motorola GM1200E Mobile Trunking Radio sets the industry standard for robustness, size and ease of use for your mobile and trunked radio requirements - according to the European MPT1327 Trunking Protocol. Motorola GM1200E Mobile Trunking Radios are available with a two line display and keypad, or with a single line display, depending upon user requirements. Because modern cars and commercial vehicles have such compact interiors with limited space for convenient and safe installation of a mobile radio, all GM1200E models have been designed for a wide range of single unit or remote head installations. The Motorola ALT process, which simulates five years of hard use in the field, is your assurance that the inevitable bumps and knocks of every day use will not affect the performance of the GM1200E and its ability to give years of faithful service. GM1200E is available in the frequency ranges: 136-174 MHz and 403-470 MHz with 12,5/20/25 kHz channel spacing, power output 1-25 Watts (VHF); 1-10/10-25 Watts (UHF). 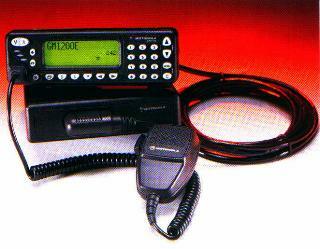 The Motorola GM1200E Base station offers all benefits of the Mobile Radio GM1200 with full keypad and display. It is available for 136 - 174 MHz, 1-25 Watts; 403 - 470 MHz, 1-10 & 10-25 Watts; 450-520 MHz 10-25 Watts. This station in connection with a desk microphone, a base tray with built-in loudspeaker, a stationary power supply with power revert and trickle charge and external omnidirectional antenna is a simple tool for fleet disposition, service stations, offices etc. The station is controlled like one of the subscriber units, which are integrated in the stationary MPT1327 infrastructure. This model consist of a transceiver and power cable in the package only. 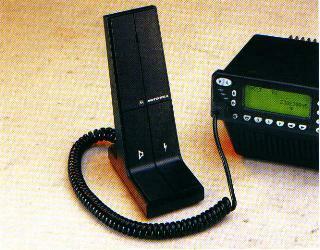 The radio comes without control head but offers all technical data which the Mobile Radio GM1200 has. 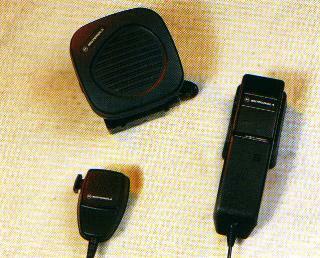 It is available for 136 - 174 MHz, 1-25 Watts; 403 - 470 MHz, 1-10 Watts; 450-520 MHz 10-25 Watts. The station can be combined with mobile or base accessories and is intended for use in MAP27 OEM applications, where the transceiver is built into other equipment. Control of the radio is via MAP27 interface. Power On/Off is controlled via the ignition sense input. GM1200E mobiles are available with a two line display and keypad or with a single line display, depending upon user requirements. Because modern cars and commercial vehicles have such compact interiors with limited space for a convenient and safe installation of a mobile radio, all GM1200E models have been designed for a wide range of single unit or remote head installations. Ignition Sense The 1200 Series radios can be wired so as to be activated by the vehicle ignition switch so that there is no risk of a "flat" battery if the vehicle is unused for long periods. External Call Alert This facility is ideal for people working outside in the vicinity of their vehicle. When the radio is fitted with the appropriate hardware, an incoming call will trigger the vehicle's horn, lights or other attention getting device, alerting the user to the call being received. User Interface features from the wide range described below can be selected to match your system requirements to provide easy to use, flexible communications. Selective calling All versions of the 1200 series Trunked radios can make the complete range of calls available on the network, including individual and group calls to other radios and calls to the telephone network. Dedicated call A single push of the dedicated call button can automatically connect you to your office or supervisor .... it's that easy! Stored number recall There's no need to use the keypad to dial frequently called numbers. Up to 40 stored radio, status, or telephone numbers can be recalled using a simple quick dial feature. Just select the number or name you require by scrolling through the stored list, and send the call by pressing the 'push to talk' button. In addition to all the standard features, keypad versions of the 1200 Series portable and mobile can make keypad dialed calls to any permitted destination and can also make 'tone overdial' calls into services such as voice mail and advanced telephone facilities. Priority calls Where permitted the 1200 series can make High Priority and Emergency calls, this facility can be triggered by a dedicated button on the radio and means that emergency calls will be routed ahead of other routine traffic on the network. Last number redial The last number called can be recalled by simply double pressing the 'push to talk' button. This makes the Motorola Radius 1200 series radios very easy to use and saves time when repeatedly calling the same person. Status calls Pre-programmed alphanumeric messages can be sent or received by the radio, eliminating the need for speech calls for frequently used messages. ID display when an individual call is received, the radio displays the identity of the calling unit. This visual information about who is calling greatly enhances the simplicity of the communication system, and saves time on each conversation. Call barring The radios can be programmed to prevent the user from making certain types of call, for example telephone calls, or the keypad may be locked to prevent any numbers being 'dialed' from the keypad. With the keypad locked, calls can only be made from the short-form dial list or one of the dedicated call keys. This provides greater financial control, and prevents the user being busy with unauthorized calls. 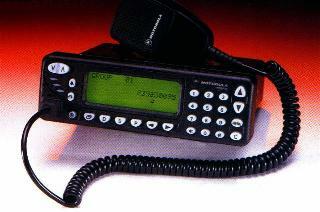 This set has a lot of great features for CB communication, including colour display, microphone dialer and a car radio. Valued at $1000.00, this model can programmed easily and has wide band range suitable for commercial vehicles.